Orissa one of the backward states the Eastern coast of India. It has nothing much to boast of but the temple of Lord Jaganath at Puri one of the most ancient and the most beautiful temples in India. 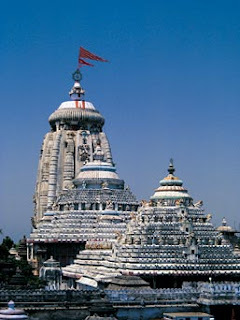 ‘The Lord Jaganath Temple’ is one in the golden triangle of grand temples, the other ones Konarak and Bhubaneswar where Lord Krishna is worshiped along with his siblings (Balabhadra and Subhadra). This temple was constructed in the 12th century in typical Orissan architecture prevailing at that time, much in tune with the style of Lingaraj temple. The image of Sri Krishna is in erect posture standing on a raised platform towering about 65 Meters tall along with his siblings is one of the biggest images of god in the world. The number of priests in the temple is astounding (more than six thousand) and assistant priests, attendants and guards constitute another 14,000! A temple with 20,000 staff may be the biggest in the world. The kitchen of the temple is the biggest which feeds thousands of devotees with its ‘Holy-Mahaprasad’ (food served from temple –considered as a holy gift from god. 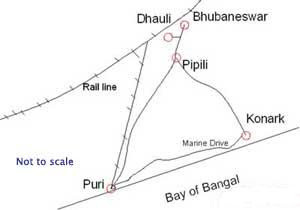 It is in Puri the beachfront town in Orissa where the Jaganath temple (in Sanskrit; ‘jagat’ is world and ‘nath’ is lord, meaning the Lord of the world) is located. 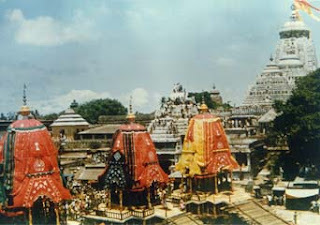 Jaganath temple and its magnificent chariots are referred wherever the English word ‘Juggernaut’ is mentioned; as Jaganath is the word that got transformed in to juggernaut, which means any object, organization or contraption that is huge, powerful and overwhelming. It is the annual ritual celebrated there ‘The Chariot Festival’ that has made this temple famous and it remains as one of the most crowd pulling events in India. 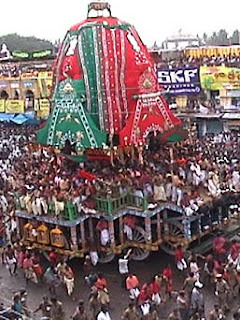 This ritual consists of dragging three huge chariots (each 14 meters high and carries idols of Krishna and siblings) placed on huge platforms that are mounted on sixteen giant wooden wheels each of about two meters in diameter. These chariots are dragged thousands of devotees (who scramble for a space to catch hold of the shaft. These huge wooden shafts are called (Bada Danda). The mega-procession dragging the chariots witnessed by millions of devotees passes through the road to the Gundiche Temple less than 3 KM away where the idols are left for eight days. 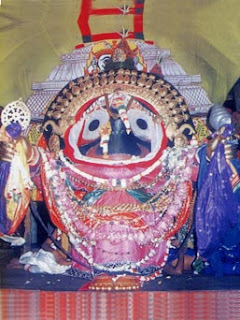 There the images are given new attires and the procession returns to its abode – The Lord Jaganath Temple. This journey is to celebrate the memory of Lord Krishna’s journey from Gokul to Mathura in the Veda era. Once the celebrations are over the chariots are dismantled and the parts are used for religious relics (they are not re-used for the next season). The mammoth procession that pass through the fully packed thoroughfare dragging the gargantuan chariots- each with the idols as well as all paraphernalia of a big temple- for their annual sojourn to another temple. This remote town turns uncontrollable as millions taken over by devotional frenzy perform everything they can do to please their Lord Jaganath. Devotees who have flocked the town from all the surrounding as well as distant areas resort to the rituals of their native areas. In early times devotees used to jump in front of the chariots thereby ending their life under the giant wheels in utter madness invoked by sheer devotion. In the burning mid-day sun drenched in sweat a million of odd devotees dissolve in to a mass hypnotism. Some sway to the chants others stand with folded hands whispering prayers addressed to Lord Jaganath. Whenever the word Juggernaut is read, heard or said remember this big and beautiful temple the huge man drawn ornamental-chariots and the millions innocent devotees from rural India who flock to this festival in search of salvation, because in their dull and dreary day today lives (their cup of woes always filled!) these celebrations make them forget their everyday miseries and lift them to world of momentary fantasy. Okay, this comment is totally off topic, so please forgive me, but I got a comment from Biby on my photo blog Images from Real Art, which he said he liked. I wanted to tell him that the Images blog really only exists to host pictures for my real blog, REAL ART (and politics and culture). Lots of commentary, music, art, video, political rants, etc. I'm sure you get the idea. Come check it out. Actually this blog, the Kerala Articles looks pretty interesting, too. I'll have to check it out myself. Thanks for dropping by my blog and leaving such nice comments. Your post is very informative, thanks for sharing. Muito obrigada por sua visita no meu blog. Espero que volte sempre. Fiquei feliz de ter um contato na Índia. As fotos do templo são lindas. Oramos muito por Vocês, para que o Senhor Jesus os abençoe com Sua graça e amor, sempre. Seu blog é um dos meus favoritos. Thank you for your visit in my blog. 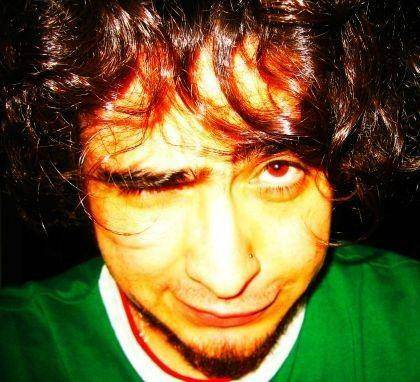 Your blog is very bealtiful. I pray my Lord for know someone from the India. Grace e peace from the Lord Jesus Christ for you and your nation. I will back. I'm confused about why you all write together. Is it to educate the world about Kerala? I have heard a little about Kerala- that the literacy rate is high compared to surrounding areas, and the people are generally better off. Never read about your lady gouldian finches before though! cool! I am glad you stopped by, thanks for the comment! I have bookmarked your blog for reading during the babies feedings!! It looks interesting, I love the pictures I have seen so far! Thank you to passing by. Actually, I never tought that a man from India could ever visit, or even read, a brazilian blog. Biby Cletus left me a comment on my blog and thought I'd return the favor. Fascinating and very informative blog you have here. It's always good to get a closer glimpse at other cultures especially from the locals. Keep up the good work. Thanks for visit my blog, friend. Thanx for visiting my blog, I did discover in yours a great deal of very interesting information about your culture, you have a very beautiful country, thanks for showing it through your blog. Thanks for its visit, I respond to its greetings from the other side of the moon. Visit to my Blog EVOLUCIONANDOME!! !